Our distribution centre is centrally located just 5 minutes from Junction 10 of the M6 Motorway- ideally situated for next day UK distribution services. Either ‘contract’, ‘dedicated’ or ‘shared user’ distribution Mainline will find the most efficient and cost effective way to meet your delivery requirements. Our highly professional team of Logistics specialists are dedicated to giving our customers a personal and efficient service at a highly competitive price. Our modern fleet consists of over 40 trucks and 60 trailers ranging from 18 tonne ‘Tail Lift’ rigid to 44 tonne gross articulated vehicles with 28 tonne payload, each vehicle fitted with ‘Kwiktrak Satellite Tracking’ system so you will always know what time your goods will be delivered. 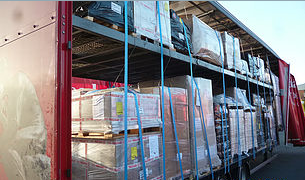 We have vehicles fitted with custom built CV Roller Technology to ensure the security of your load in transit. Single pallet to full loads. Next day and same day service. Dedicated & Tail Lift deliveries. Bespoke transport solutions to meet our customers individual and specific needs. Our highly professional, fully trained, smart and permanently employed driving staff are dedicated to ‘delivering your promise’ with the emphasis of your goods being delivered on time and undamaged. We operate – ‘Stirling Solutions – Traffic Desk’ software – this enables our users to dynamically manage and optimise the delivery of goods, services and information, with POD scanning all of our customer queries regarding documentation can be resolved instantly, simply at the touch of a button. Potential disputes can be resolved easily through reprinting, faxing or emailing copies of POD’s directly and instantaneously. Mainline are very conscious of our impact on the environment and have invested heavily in our modern fleet of ‘Euro 4 & 5’ – low emission trucks to keep our carbon footprint to a minimum! We carefully monitor fuel economy and plan routes to minimise mileage and empty running.